We put a Medium and XL on our two Fit Check mannequins Huey and Dewey. We generally buy test jackets in a Medium for Huey and an XL for Dewey (41” and 45” chest respectively) assuming these jackets would fit “normally”, and were able to get them on the two mannequins, but it was a very tight fit (click the “View Larger Images” link above to see). The Tracer Overshirt is an option for riders that want some protection, but don’t want the bulk and styling of the traditional motorcycle jacket. There is no question that a “shirt” like this (or any other shirt style I’ve seen) can’t provide the same protection as the full-on riding jacket, but I will have to say that this Tracer Overshirt is a lot more sturdy and well thought out than most I’ve seen. The material used for the Overshirt is a heavy duty canvas material that is made of cotton and abrasion resistant polyamide and is produced under the trade name Cordura denim. Most everybody agrees that plain denim doesn’t do much for you in a fall, but this material, being specifically designed to resist abrasion, should do a much better job. It “feels” like to me it would do very well. The styling is subdued, but also kind of sharp. The material has some stiffness to it so it doesn’t look wrinkly or unkempt like plain denim. Please see our sizing advice for fit, but generally speaking, please be aware this shirt has a trim cut to it. Average to skinny guys will like it. Stout guys, particularly short and stout, probably won’t. The shirt closes with a zipper and then buttons… kind of like buttons on the fly of jeans. Know this: the buttons aren’t quick to button. When zipped, there is limited material to grip to force the button through the eyelet which makes it sort of a pain. I’m sure, with some practice, it will go easier, but at first, prepare to be a little frustrated. It think it is neat that they thought to make the last button covered, so it won’t rub on your tank. 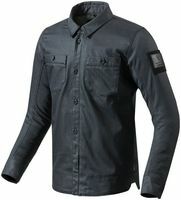 This overshirt comes with Seesmart armor in the shoulders and elbows which is extremely thin and flexible. More traditional armor just wouldn’t work well with a close-fit shirt style like this, and so this armor works great. There is a layer of extra abrasion resistant material on the back side of the elbow armor pockets to give more resistance in that crash-critical area. The material is not visible because of the shirt’s inner liner, but it is there. No back protector comes with the overshirt, but you can add one (see below). If you plan to do so, add about 1” to your chest measurement when considering what size to pick. The shirt can connect to jeans with a loop that goes around your belt, and there is also a short rear zipper to connect to REV’IT motorcycle pants. Add a Back Protector: This jacket is made with a pocket to accept a Seesoft CE Level 2 Back Protector Insert type RV (RV refers to the shape). For sizes Small or Medium, choose size 4; for Large thru XXL, choose size 5.